It’s December 13, or Saint Lucia’s day today. 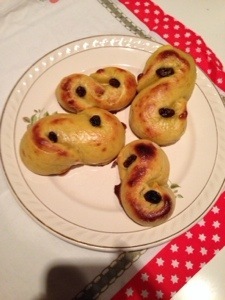 What better day to make Lucia buns? The recipe has been translated and adapted from this one. 1. Heat butter and milk together in a saucepan, until the temperature reaches 37 degrees. 2. Crumble the yeast in a spacious bowl. 3. Pour a bit of the liquid into the yeast bowl, and mix until the yeast has dissolved. Add the rest of the milk. 4. Mix the quark cheese, saffron, turmeric, sugar and salt into the milk/butter/yeast. 5. Add the flour, gradually, while working the dough in a kitchen machine. 6. Once the dough is smooth and flexible, cover it with a towel and let it stand to prove in room temperature for about an hour. 7. Lift the dough to a lightly floured surface and knead for a while. 8. Divide the dough into roughly 30 pieces. 9. Roll the pieces into “sausages”, about 2 cm wide, and shape them like an S, and tuck the ends into the shape. 10. Put on baking sheets. 11. Press down a raisin in each of the holes. 12. Prove for another 45 minutes. Approx. to double size. 13. Turn the oven on to 225 degrees. 14. Whisk the egg with 1 tbsp milk and brush this over the buns. 15. Bake in the middle of the oven about 5-8 minutes until golden brown. 16. Take them out and let cool somewhat before eating.